Each Tuesday we feature audio or video of an SR Contributor reading their work. Today we’re proud to feature a podcast by Sarah Pape. 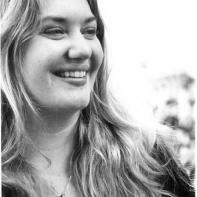 Sarah Pape lives in Northern California and teaches English at California State University, Chico. Her poetry has recently been published in The Southeast Review, Hayden’s Ferry Review, Watershed and Cadence of Hooves: A Celebration of Horses. Her chapbook, Road Z, was published by Yarroway Mountain Press. Committed to community arts and literary collaboration, she is on the board of the 1078 Gallery and leads creative writing workshops. Wow. It was haunting when Sarah read the last three lines of “Prayer Thirteen.” So much emotion is expressed in that prayer. Beautiful!